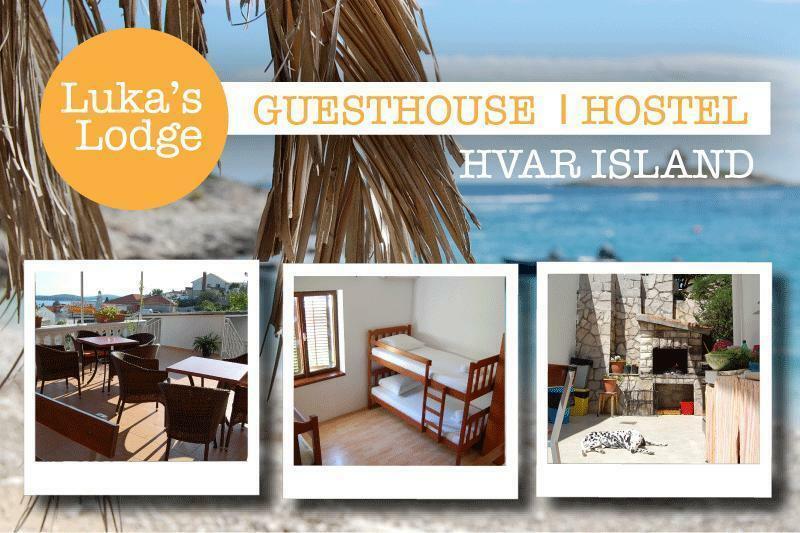 Ideally located between the local beaches and the center of Hvar Town, within easy walking distance to the main bus and ferry terminals, Lukas Lodge provides secure, clean, and comfortable accommodation in a great location. Luka has been running his lodge for over 20 years and treats every guest like a long lost friend, offering the finest Croatian hospitality as well as local insight and information on Hvar and beyond. Comfortable accommodation: A range of room options all with air conditioning, 24 hour hot showers, bed linen, towels and blankets provided. Each dorm has its own bathroom, fridge and lockers. Laundry facilities available. Self-catering facilities: A fully equipped outdoor kitchen and barbecue entertainment area as well as additional indoor kitchen and deck with views over the neighboring islands. Free WIFI, Guest Computer and Printer: Internet available free of charge, connect with your own device or use our Guest Computer. We also have printing services available for guests. We have scooters and bikes available for hire as well as snorkeling equipment and reef shoes. Island tours can be arranged. We provide free short term luggage storage for our guests. Check out is at 10.30am. Local Owner: Want to learn some key Croatian words? Advice on the best local sights and restaurants? Local born Luka is fluent in English and Croatian and is always eager to help, he can also help you get the best out of your time in Croatia with contacts in Dubrovnik and Korčula. 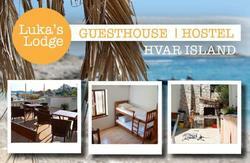 Come stay with us and make the most of your time on Hvar! If you advise Luka of your arrival time he will collect you from the ferry terminal. The number will be on your booking confirmation. 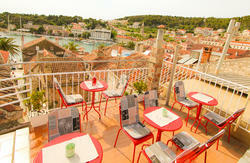 When you get off the boat at Hvar harbour, you'll be on the pier. The pier stretches out to your left, and you can see the castle in the distance. On your way up the stairs, there is a restaurant about half way up on your right. Towards the top of the stairs there's the local football team emblem on the wall (to your left). Now you're at the top of the stairs, turn right and start walking along the street. On this street you'll pass seven 'stations of the cross' (small stone huts). Keep walking past these until you see the stairs to a school on your left (a building signed 'SKOLA'). There is an orange box which usually has a traffic arm connected to it after the school, and immediately afterwards there will be a street rising up to your left with some stairs. Turn left here and start walking up. Please be careful because the pavement here can be quite slippery! The street will lead upwards to a small flight of stairs. Take the stairs to the road, then urn right and follow the street. After 100 meters, to the left you will see a yellow sign for Luka's Lodge. Walk up the stairs, and Luka will be there to greet you!